Animal Friends is organizing a program in the occasion of its first anniversary. The program is based on lectures, video projections, platforms, exhibitions, public actions, protests, street forums, healthy food fairs, book presentations (Vegetarian guides through Zagreb, vegetarian cook-books) fashion shows, carnivals, music rooms, parties, eco-trips, and other informative and educational fun contents. 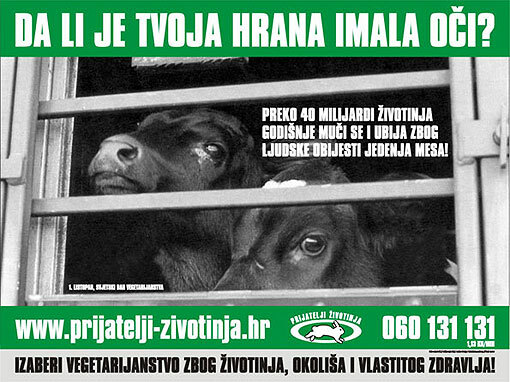 The biggest program announcement is a billboard for the World Vegetarianism Day with the title "Did your food have eyes?" set up on the Cibona Tower. The program starts on October 1 on the World Vegetarianism Day and will last until the October 19. We will mark other important dates as well: World Vegetarianism Day, World Day of Protecting Laboratory Animals, World Day of Protecting Farm Animals, World anti-McDonald's Day and World Animal Protection Day. On Monday, September 30, from 11 A.M. in the office of the organization reporters can find out what they want to know about the organization. On Tuesday, October 1, in front of the entrance of the Importanne Center we will celebrate the World Vegetarianism Day by giving flyers, recipes, books, vegetarian food, and signing up for introduction of vegetarian meals. At 6 P.M. in the club MAMA in Preradoviceva ulica 18 will be the projection of Paul McCartney's film "Devour the Earth."